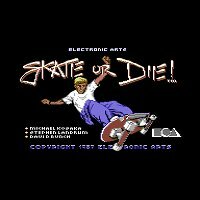 I loved the Skate or Die! series. Used to play it all the time on the NES. :P Too bad the title music failed in comparison to the C64 version. Just so you know, Rub Hubbard ROCKS! Thanks. XP I was trying to make the theme sound how it might've sounded had AdLib support been featured in the DOS version of Skate or Die!, but it only supported either the single channel PC speaker, or the Tandy PC systems which used a 3 channel speaker.